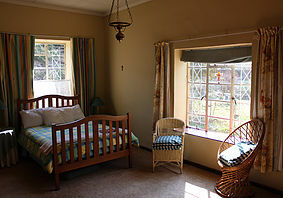 The original homestead has been converted into guest accommodation that is ideal for a family of five or two couples. It consists of 2 double bedrooms, a single bedroom, a family bathroom with shower and bath, a fully equipped farm kitchen, dining area and comfortable lounge with fireplace. 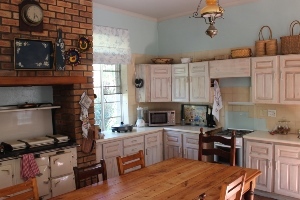 The cozy farmhouse kitchen is fully equipped with stove, fridge microwave and for those cold winter months a traditional Aga stove warms up the entire house making this the ideal place to gather around the table to soak up some warmth. A beautifully warm & sunny room which gets both morning and afternoon sun. The bedroom consists of a double bed. This second bedroom gets plenty of morning sun and consists of a double bed. A unique room with single bed.